Okay, so I have been trying something new this week, I have been hauling water back to Wanda each day. I am doing this with my trusty backpack and 4, 2 litre bottles. I am doing this in an effort to stretch out the times that I need to find a dump station. At a dump station is where I dump my tanks and fill my fresh water tanks as well. There is a dump station in my Eastern Home, but they haven’t had water available for about three years now and the place is slowly falling apart. What I have been doing is hauling my 8 litres of water back to Wanda each day, and then first of all pouring all of it into Wanda’s fresh water tank. This worked so well, and I have been using so little of the water in Wanda’s fresh water tank, that it only took Monday and half of Tuesday’s load to fill it up again. This morning I didn’t even haul water back at all, as I was contentedly full. 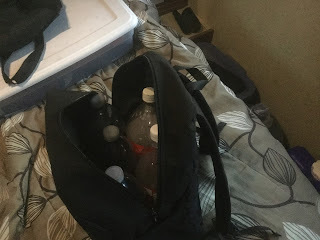 If I keep this up, I can wait until the next time I go to a campground to dump (included in the camping fees) and fill up all of my fresh water tanks. If I need to, I can dump my grey and black water tanks, at the dump station in my Eastern Home and not care that they are not giving me fresh water. This little trick means that I can harvest water from anywhere that there is a tap and keep my tanks full.